Editor's Note: This essay was submitted as part of the writing requirement for the edX MOOC Poetry in American: Whitman, offered by Harvard University. Here Whitman is saying that when what one would consider to be Whitman himself, in the common meaning of the word “himself,” is dead, his atoms will return to the earth and become a part of earth’s ecosystem. 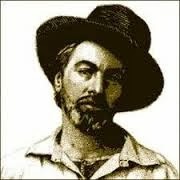 Absorbed into the fabric of the earth, what was Whitman will remain Whitman--a Whitman just as profound, just as rare, just as wonderful as the grass whose roots his dead body may nourish.